MUFFIN&PEDAL: NZDS ROUND 2 @ Langlands Backyard. 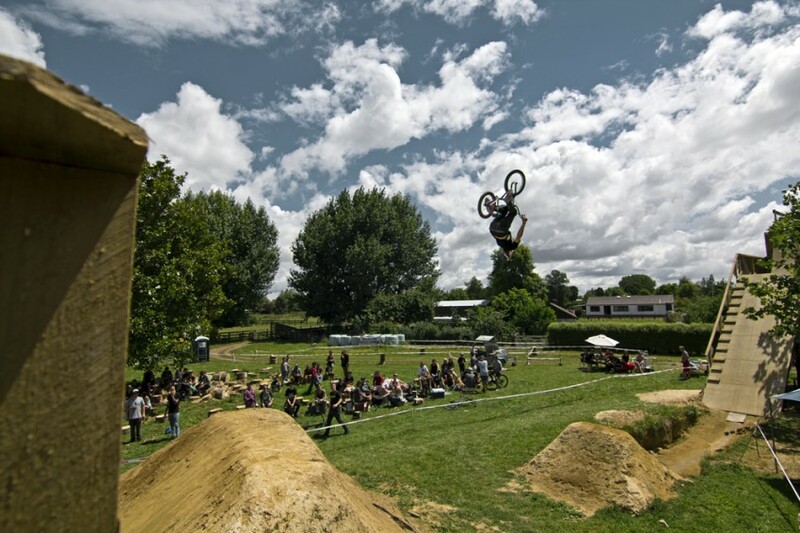 2 Weekends ago was the second round of the New Zealand Dirt Jump Series held at no other than Paul Langlands backyard in Cambridge. The event brought out the usual suspects like the Bolter twins, Paul Langlands, Hugh Wotherspoon, Josh De Reus, John Riddle and Alan Cameron to mention just a few. The only person that seemed to be missing was the infamous Jed Mildon. 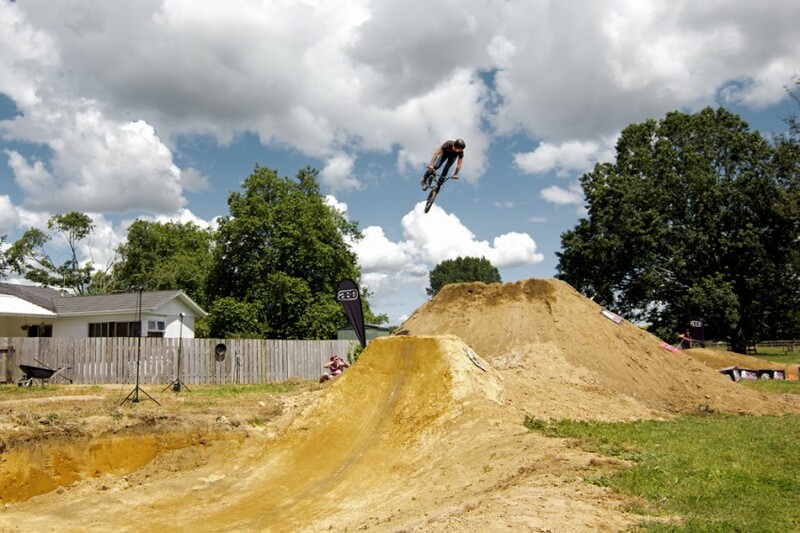 The setup was crazy, ahuge 20 odd foot roll in through which the riders pedalled flat out and through the bomb hole that hit an overhead height lip across 28 feet to the landing. That was the ‘setup jump’ for the second jump which was also a biggy but considered the ‘trick jump. After the second was a berm a small hip and a small jump which had seen better days and were reminiscent of Langlands pre-North American trip. Guess he must’ve found inspiration to build big in North America. Here’s a look at Jump 1. Yes it’s a backflip but it’s the best shot of the Roll in and 1st jump I have and it’s also almost 30feet across. Retarded! A bit more in line with our values, Langlands with a massive 30 foot Whipout. 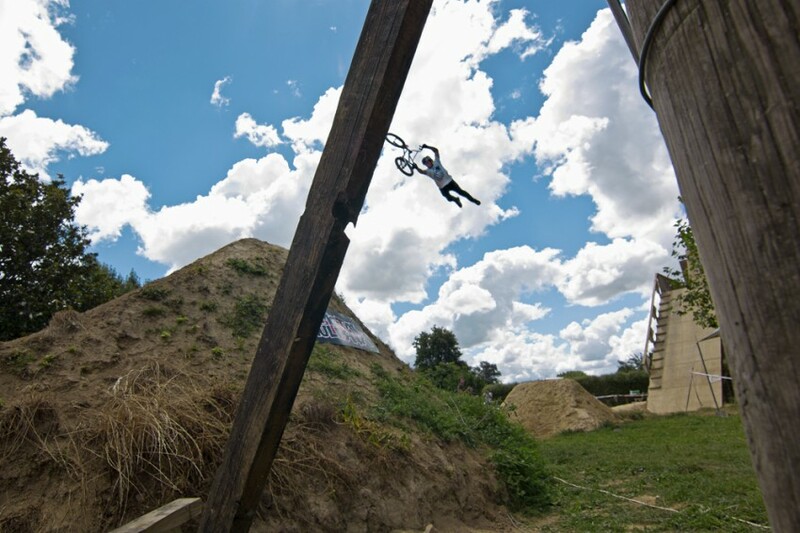 Shredder and all round nice guy Alan Cameron was around to throw down his signature Turndowns and nose dive Oppo 360’s. The less evil of the 2 twins George was on hand to showcase his natural ‘chill’ styles as witnessed with this lazy Downside Whip. Hugh Wotherspoon and Paul Langlands dominated all day and set the tone from the outset and that was if you could trick the first jump you pretty much a shoe-in for the finals . There weren’t many to trick the first (some were hardly making it) so you know that when Hugh was flipping and fronting the 1st then this pic comes off as a pretty relaxed 1-hand 360 to over the 2nd to complete his run (check out his hand in the shadow, way off). Signature Langlands steez, stretched out Superman. 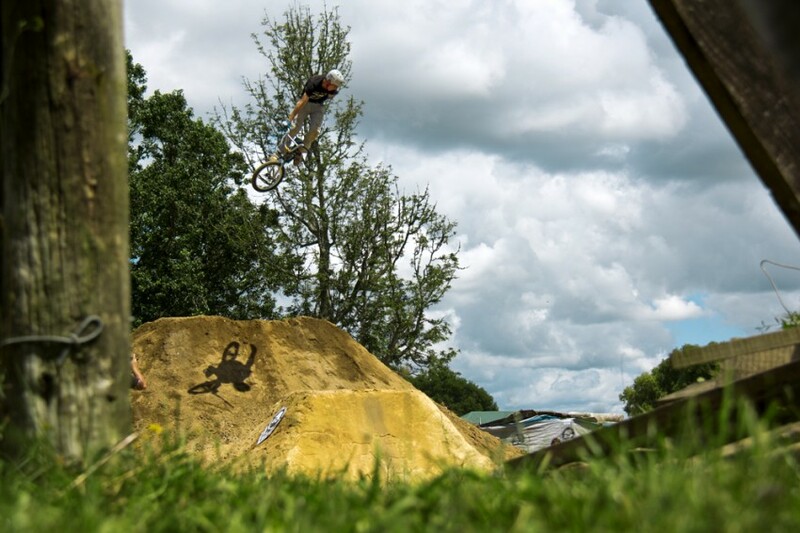 I was suprised and stoked to see trail boss Caleb Davidson from Whangamata turn up (a little late) and shred with that classic dirt jumper style. 1-foot nacnac just like a trail boss should. Another shredder of note and non too unfamiliar with Langlands yard was Josh De Reus here with a 360 Whip, I think he may have landed a 360 Double Whip when the boys were gunning it out for best trick. This young’n is gonna go far, I’ll tell ya that fer nothin’!